For each quesadilla, spread tortilla with 3 tablespoons bean dip. Top with 1/2 cup cheese, 1 tablespoon cilantro and another tortilla. Heat large skillet over medium-high heat until hot. Place 1 quesadilla in skillet; cook 2 to 4 minutes or until bottom of tortilla is golden brown. 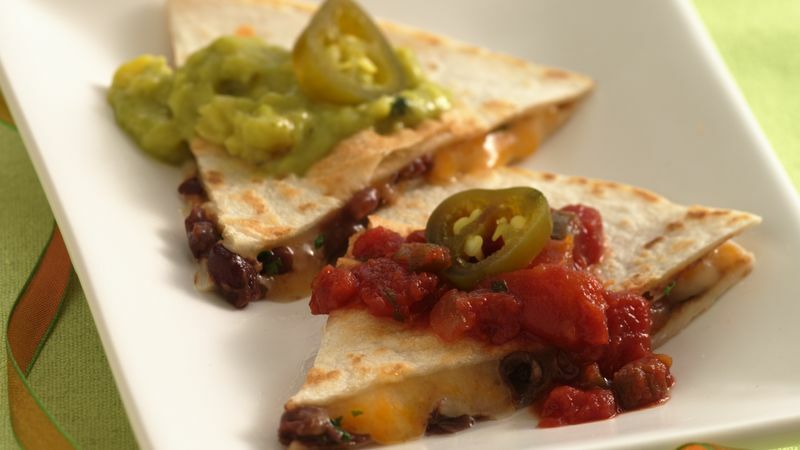 Turn quesadilla; cook 1 to 2 minutes or until thoroughly heated and cheese is melted. Remove from skillet; place on cutting board. Repeat with remaining quesadillas. Cut each into 8 wedges. Garnish each with 1 jalapeño chile slice. Serve with salsa and guacamole.